Segmenting audiences enables a program to focus on those audience members who are most critical to reach and also to design the most effective and efficient strategy for helping each audience adopt new behaviors. Audience segmentation enables programs to match audiences, messages, media, products and services based on the specific needs and preferences of the audience. Tailoring an SBCC strategy to the characteristics, needs and values of important audience segments improves the chances for desired behavior change. Who Should Conduct an Audience Segmentation? A small, focused team should conduct the audience segmentation. Members should include communication staff, health/social service staff and, when available, research staff. Typically, the same team conducting the audience analysis will also conduct the audience segmentation. When Should an Audience Segmentation Take Place? Audience segmentation takes place during audience analysis. To gain stakeholder input, the audience segmentation can also be part of the stakeholders’ workshop. Within audience analysis, audience segmentation can be completed in a few hours. Define the audience segments for a particular health issue. Select an appropriate audience segment for the intervention. The program has a budget that allows for multiple approaches. Segmentation requires extra effort and resources (e.g. time to properly segment audiences, funds and staff time to design separate messages and materials, funds to use additional channels). If the budget does not allow for multiple approaches, identify the most important audience segment to reach and focus on that segment. If it makes sense to segment, then the team needs to decide what criteria to use to segment the audience(s). First, look at the primary audience(s) and identify traits that make a subgroup significantly different from other audience members. A significant difference is one that requires a different messages or approach. These differences are typically based on socio-demographic, geographic, behavioral or psychographic differences among members of the primary audience. Segment the audience by using the criteria identified in Step 3. There are various methods teams can use to segment audiences. One option is to use a segmentation table. In Column 1, list the primary audience(s) chosen during the audience analysis. For each audience, identify potential segments based on the criteria from Step 3. Another option is to create a segmentation tree, starting with a potential audience and dividing it by differences thought to be important. Stop when the need or ability to target differences ends. 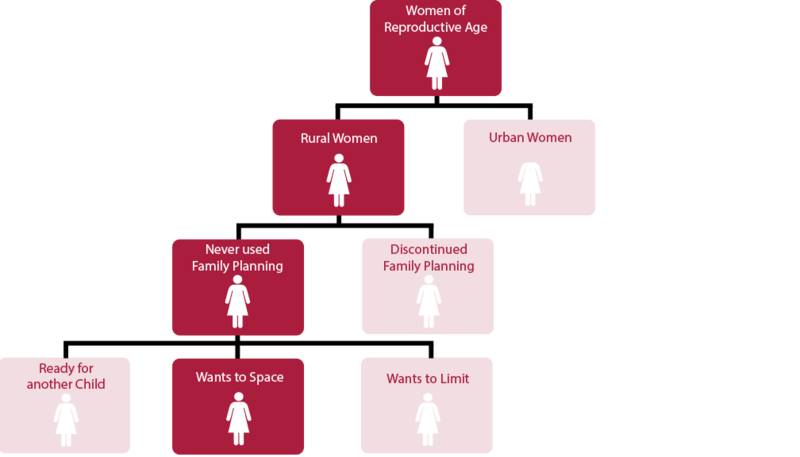 The example below presents one line of a segmentation tree for women of reproductive age. A complete segmentation table or tree highlights potential audience segments. In the examples above, many segments are identified, including: current FP users, urban dwellers, women who value convenience, and women who want to space children. The program team now needs to determine which segments it should prioritize. Impact: Look at the size of the segment and ask whether behavior change in this segment will have a significant impact on the problem. For example, will focusing on women with no children significantly increase contraceptive use and decrease maternal mortality? Are there enough women without children to make a difference? Accessibility: Determine whether the program team is able to reach the particular segment with the resources available. For example, does the program team have connections with the rural audience? Can it work with rural leaders to ensure its message is delivered? Program priorities: Programs often need to show impact early and quickly. In such cases, it may be necessary to choose audience segments whose behavior will be relatively easy to change. For example, the team may need to focus first on those who are already thinking about making a change (in the Preparation stage of behavior change) and then focus on harder-to-reach segments—requiring more time and effort—later in the program. Using the suggestions above, finalize which segments the program will target. The number of segments will be based largely on the resources available and program goals. Once segments have been selected, ensure they are valid and usable. Use a checklist to ensure each segment meets the criteria for effective segmentation (see Audience Segmentation Checklist in templates). If a defined segment does not meet the criteria, it is best to drop it and consider other segments. The audience analysis guide outlines how to develop audience profiles. Profiles might need to be refined or added based on further audience segmentation. Write the creative brief with the profile for each segment in mind. Ensure the program has resources to address multiple segments before engaging in the process of segmentation. Look for ways to leverage funds with other programs so that additional segments can be reached with tailored messages and interventions. 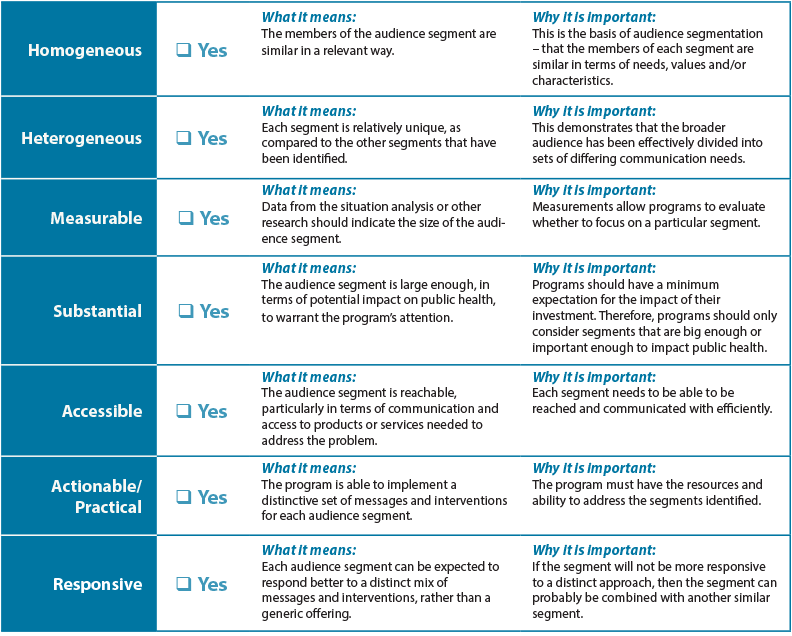 Ensure that the segments chosen are different enough to warrant different messages and interventions.